In the late '70s more and more toy companies were releasing toys with simple computer circuitry. Mattel and Coleco started their now-famous electronic hand-held sports game line in '77-'78 and Milton-Bradely joined up in 1978 with the memory game Simon. This was one of the first games I remember needing two sizes of batteries to work - 2 Ds and a 9 Volt. The premise behind Simon was quite simple. It was based on the old game Simon Says. You would start the game and one of the four colored panels would light up and sound a tone. Your responsibility was to press the panel that lit up. Simple enough. Then Simon would repeat lighting that panel and add another. Now your job was to press the two panels in order. The number of panels would continue to increment until you could no longer remember the sequence which would cause Simon to issue a harsh buzz. In 1979 MB released Super Simon which allowed two sets of panels so that two people could play against each other. In 1980 Pocket Simon was in stores, a smaller version of the original game. There was also a Simon released with a clear casing allowing you to see the circuitry. 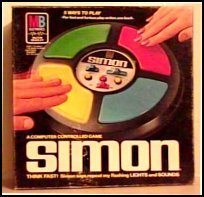 Simon is one of those toys/games that is plentiful today and almost always clean and still in it's original box. This can hurt it's selling price since just about anyone who wants one can have one! Despite that there is still an issue with the game's need of two battery sizes. One problem with all late '70s early '80s electronic games is missing battery covers. As you have already guessed Simon had twice the opportunity to be come up short a cover. Of course this should further reduce the selling price. Are you still here? What are you waiting for? Go get you a Simon, they're practically giving them away!